Festival Report - Govardhana Puja Celebrations ~ The Toronto Hare Krishna Temple! 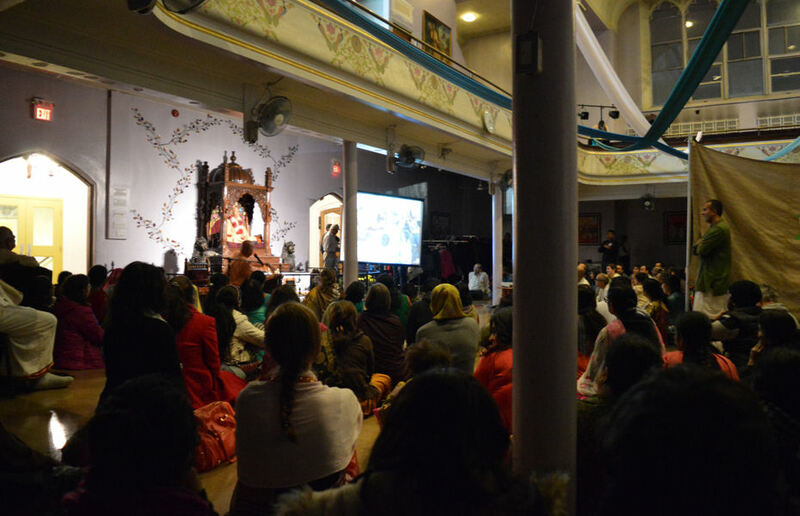 On Thursday, November 12th, the Toronto Hare Krishna temple celebrated Govardhana Puja. The festival marks the occasion when we celebrate the story of Lord Krishna protecting the citizens of Vrndavana from a torrential downpour of rain. The festival began with kirtan and continued with a class by Bhaktimarga Swami. Maharaj had just arrived back from a 45-day walk in the United States, commemorating Srila Prabhupada's arrival 50 years ago, in 1965. Bhaktimarga Swami's walk took him from Boston to Butler, Pennsylvania to New York City. After spending some time talking about the significance of the festival of Govardhana Puja, Maharaj then shared some stories and pictures from his walk. After the class, everyone then oriented themselves around the incredible hill which had lovingly been made by the temple's Pujari (Priest) Department. As everyone took darshan (audience) of the magnificent hill, made entirely of sweets, kirtan captured everyone's hearts. Everyone then had a chance to circumambulate the hill as the kirtan continued and led into the 8:00pm arati (kirtan). A huge feast awaited the massive crowd as everyone had a chance to partake in delicious prasadam and also enjoy the many sweets that decorated the hill! All in all, the festival was a smash success and devotees thoroughly enjoyed the experience!